Even before our triumphant November 29 Zax- Sim bog day, I had booked a flight to Boston. I knew that getting to 400 by Dec 31 in Minnesota is a long shot. Maybe without work, family and holiday responsibilities it could be done? But even then, it would be a hollow victory – celebrating as unemployed jerk and all. Son Jeff is a new home owner in New Hampshire and could use a hand with some repairs. I booked a trip to see him. The east coast has mostly the same birds that Minnesota does except for one thing: The coast. The salty sea, bays and brackish marshes provide unique habitats, that house their own species. I did some advanced research. By going out a couple days early and hitting the coast, I should find 6.5 new 2018 species (expected value). Yes, these are the sorts of probability calculations bird nerds do for fun. Do you think there is a “Behind the Birding” television serious pilot here? My plan was to bird from Cape Cod, south of Boston, to Jeff’s in southeast New Hampshire. I also found online that a Cape Cod birding club had a field event scheduled for the morning of Dec. 6. You know I’m crashing that party! The plane touched down in Boston at 10:30 am on Dec. 5th. I rented a car, bought a sandwich and bolted for nearby Belle Island Reservation Marsh. I had a pleasant walk covering all the trails quickly. Tallied 16 species, but nothing new. Northern Mockingbirds and a Hermit Thrush were a surprise this far north in December. It was now 12:30 and I knew it would be dark by the time I got to the cape. I opted instead to find the closest sea water. I can drive south in the dark. Boston’s Revere Beach, which is in a protected bay, was nearby. There were 1000’s of birds on the water. Mostly Scoters everywhere ( Surf, White-winged and Black), and tons of gulls on the beach. I set up the spotting scope and scanned the water. Right away, what’s that white in the sea of dark scoters? Bingo, Common Eiders (#397)! A couple hundred of them. I scanned the gulls, Greater Black-backed, Herring, and a few Ring-billed. Nothing new jumped out. I find no Kittiwakes among them. I turned the scope back to the sea beyond the sea-ducks. There are a few scattered birds to the north, ½ to 1 mile but I can’t see enough detail. They bob up and down behind the waves and keep diving. Loons, or grebes? Maybe. I dump the scope back in the car and move north ½ mile cutting down the angle. Now closer, I can see better. Loons I’m pretty sure. But I can’t make out the bill detail. I move again, another ¼ mile north and set up again on the sidewalk of this busy 4 lane street. Parking is easy. Few humans go to the beach on a cloudy, breezy, December day. Don’t forget your sunscreen. There is constant traffic. Trucks, cars, honking... Then I hear a crunch. Someone rear ended someone. They pull over next to me and jump out. No one is hurt. I remain just a few feet away standing behind my tripod with my eye buried in the scope and my ears filled with their bickering. Scanning the now closer loons I see several: Thick bill… Yep, winter plumage Common Loon. Next one, another Common. Next one, slighter, lighter color, lots of white on side of head, smaller bill! Confirmed, Red-throated Loon (#398)! What an amusing “natural” paradox. Standing alone among tall condos lining the busy street, crunched autos and agitated voices. I want to fist pump the air in victory but tempered it. I scan another hour or so. 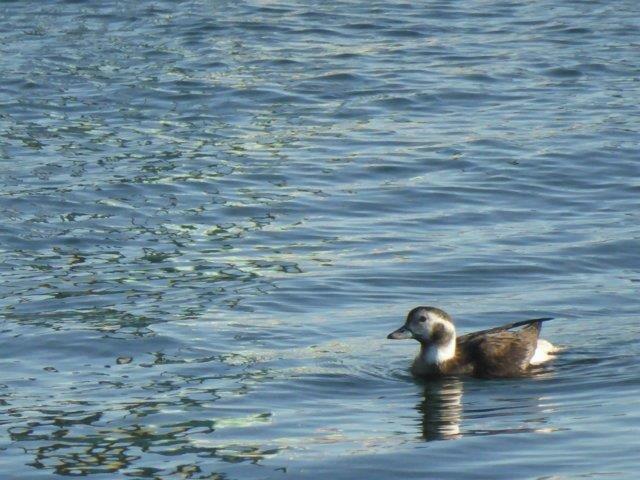 See more loons, eiders, scoters and gulls, but find nothing else new. There are so many birds on this long beach that I likely missed something good bouncing on those gentle waves? It’s cold and getting late and time to start the long drive south. I found a cheap enough crappy motel near Sandwich, MA to rest for the night. Luckily, I’d brought my good 25 degree sleeping bag, to stay warm. In all fairness to the management, they never promised the room would be heated. The place reminded me of one that we stayed at near Denver in January. Energized by yesterday’s success and the frost in my room, I awoke early. I am to meet birders at 9:00 am at the end of Cape Cod. There was time for a couple stops along the way. But which stops to select? I’ve never been here before. I consulted the Birdseye app on my phone to see what other birders have reported. I noticed a Purple Sandpiper was seen the day before at a place called Great Island. Purple sandpipers are shorebirds that prefers rocky surf habitats over sand or mud. There are jetties at Ponce Inlet, FL where they are known to winter. I found them there in 2013 and 2017. I made 7 trips there in late winter 2018 to find them, and hunted for them up the coast to SC, but never did. It’s funny how, after failed attempts, one’s mind starts to believe that this whole species of birds is monitoring your movement. They conspire to actively elude you. I believe their top agenda item at the International Meeting of Purple Sandpipers, is “How to Avoid Hughes”. I envision them sitting in rows of chairs at some Hilton meeting room, drinking coffee and checking their smart phones. Meanwhile the keynote sandpiper stands at a podium with a power point screen revealing my travel plans and hawking 007 anti-detection technology. So you can see why I selected Great Island. It was personal! Google maps guided me directly to the rocky spot of Great Island… almost. The last ¼ mile is a gated community. I can’t get there. The sighting reported online must have been by a resident in this gated community… or entered by a Purple Sandpiper itself trying to throw me off. Foiled again! Borrowing a trick from yesterday’s time management tools, I bolted for the nearest salt water, Seagull Beach. I’m the only car in a big parking lot. There’s a short boardwalk through the sand dunes to the beach. This is a nice sandy spot with no rocks. I’m sure it is crowded all summer. No chance for Purple Sandpiper. I see a few gulls and waterfowl down the shore. A couple look big. Geese, dark ones with a white neck marks. Bam! They’re Brandt (#399)! They are just hanging out near the ocean shore. This time I was all alone and could fist pump the sky and do all the touchdown dances I wanted. I watched the birds for a while, recalling the only other time I found them, in FL in 2017. “I’m Doug, he’s not here yet.” We chat very briefly, while several people walk up including Mark. There are no introductions, and little conversation. These are local birders, acquainted with each other, but not particularly friendly. Birders are usually gregarious. This group was not. An aberration. An unusual culture among birders. No one seems to be interested that a Midwesterner has come to learn about their birds. Sudden everyone’s attention turns simultaneously to a bird that pops up to the water’s surface from under a tethered boat nearby. It’s a Razorbill (#400)! Also a life bird for me! 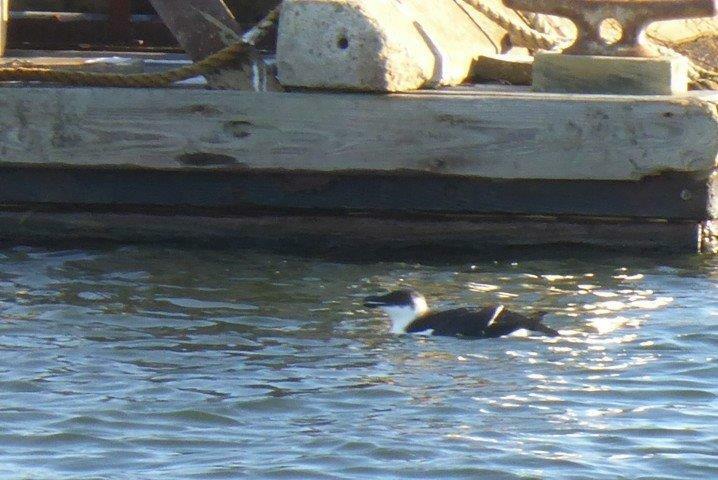 I could tell it was a Razorbill, because everyone was saying “There’s a Razorbill.” I had done it! I had my 400th bird. I’d accomplished my yearlong goal. A bird I’ve never seen before, at a place I’d never been before , with a bunch of birders I’d never met before. (And yes, I did check a bird book later to confirm the ID for myself.) Just like with yesterday’s Red-Necked Loon, it feels surreal. We are all standing together. A strong dozen, pointing our binoculars together at the same Razerbill. It dives and surface a few times ignoring our stares. I’m concealing my excitement. These folks are birders. My kinda’ people, right? I can’t contain myself. So I mention to the group that it was my 400th species for the year! There is no response? None! I was not bragging. I did not shriek like a school girl. I said it in an appropriate tempered tone. A statement of fact. Just sharing some good news. I expected more, but not just crickets? No one responded. Come on, guys? You’re killin’ me here! It’s kind of a big deal? Someone could at least acknowledge it? Of course, most people don’t care. But birders know. It’s not like I’m Uncle Rico or Al Bundy reliving a high school football victory to a stranger on the bus. We are birders. But just like Yukon Cornelius searching for gold… Nothin’! I positioned myself defensively, so no one could push me off the wharf. The whole situation still makes me laugh inside. Eventually, these zombies and I, all moved down the pier to scan more open salt water. 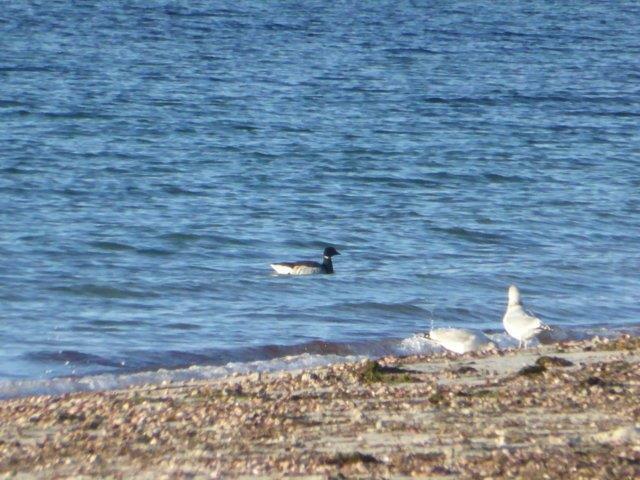 We find more Brandt, Scoters, Buffleheads, Loons and a Long-tailed Duck (#401). Just like that. Next Mark spotted 3 Goldeneyes, and suspected one was a Barrrow’s Goldeneye. It was in the water, but a strong ½ mile down the beach. We all get in our cars and parade to the closer beach parking lot to get a better look. Yep, Barrow’s Goldeneye (#402)! Our birding tour continued for the rest of the morning. We convoyed around visiting several sites on outer Cape Cod. The last stop was at the end of this long peninsula, Provincetown. We walked MacMillion Pier to the end. Two Great Cormorants (#403) lounged on the rock jetty! Soon after the tour was over. I thanked my inert partners. We waved good-bye and all headed for our respective cars. One of them accidentily backed her car into a large parked plumbing truck. All heads turned at the flinching sound. The two plumbers, whose lunch was interrupted by the jolt, jump out of the truck and watched her pull away. Without even hesitating she just drives off, cracked bumper and all. Fortunately, there was no damage to the trucks heavy rear bumper. In just 26 hours since the plane touched down, 7 species were added to my list and surpassed 400. Three were lifers. There’s nothing like a change in venue to rejuvenate birding. Now it’s time to turn the car north. I’m excited to see son Jeff in New Hampshire tomorrow afternoon. In flight they look like a football with wings. 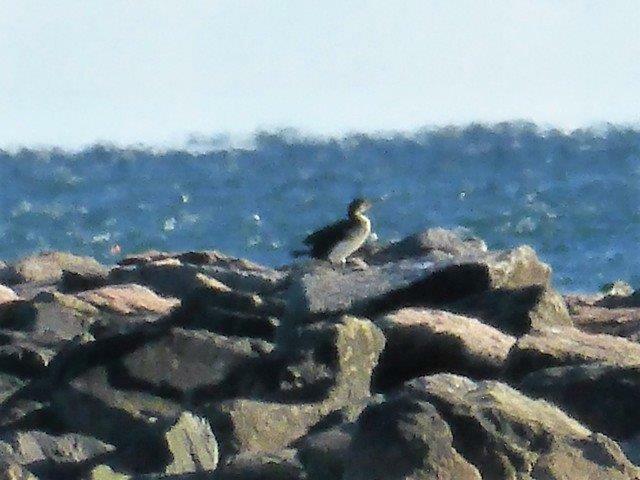 The view was better than this through scope, but I had to strain to ID it so far from shore. Older PostThe 400 Bird Quest - I’m a Bold-Faced Liar?